I’m a crusty old expat that has lived in the Philippines for over six years. But I’m still like a kid at Christmas when I discover something new. Especially if it’s new and shiny. So when I discovered a surprise item at our local sari sari, a new 250 ml Pepsi Slim can, I was excited as a tick on a fat dog. My asawa and I had gone to RGL Pottery over in Buena Vista, a 45-minute drive on the other side of our island province home of Guimaras. On the way to purchase some new pottery, my wife spied a place alongside the Buena Vista town square selling plants and flowers. A grizzly can zero in on the smell of food a mile away; my spouse can zero in on a flower stand 50 miles away. You might think I’m exaggerating. I’m not. So after a buying trio of frogs, and an assortment of vases and flower pots at RGL, we made a stop at the square. There was actually a fiesta going on with an Agro-Fair in progress. My wife had hit the lottery! It was noon time and the torrid tropical sun was hammering me. My wife covered herself with a huge scarf. I had no cover. After parking about seven blocks away, my wife designated me to go back and move our Ford Ranger. I had initially suggested she park closer. She ignored my suggestion. You married guys know what I’m talking about. My asawa had located an empty space in front of The Secret Garden outlet and asked the owner if we could park there. Since the owner was well-acquainted with my wife, having sold her plants and flowers at our annual Manggahan Festivals, she was more than happy to let us park there. I managed to get over to our truck without suffering heatstroke and emptied my water bottle. I had earlier emptied my bladder along the road, behind our truck, after we left the pottery place. I knew once we started the hunt for new flowers, we were going to be there for a long time. After hitting a couple of places and loading our truck, I convinced my wife to take a break. There were a line of stores and eateries across the street. I advised her I would watch her new batch of flowers and plants if she would go over and get us a couple of drinks and a snack. After a few minutes she came back with a couple of cans that I thought were energy drinks until I spied the Pepsi and Mountain Dew labels. I expressed my amazement at the novel new cans and quickly quaffed my Pepsi. Now 250 millimeters, a splash over one cup, is barely enough to wash a gnat’s pee pee, let alone quench a 200-pound American expat’s thirst, but at 14 pesos a can, 30¢, I wasn’t going to complain. I asked my brother-in-law Joery, who in addition to working on various projects at our new home in the Philippines, also has a salted egg business and sari sari store, if he had ever seen these Pepsi or Mountain Dew Slim Cans. 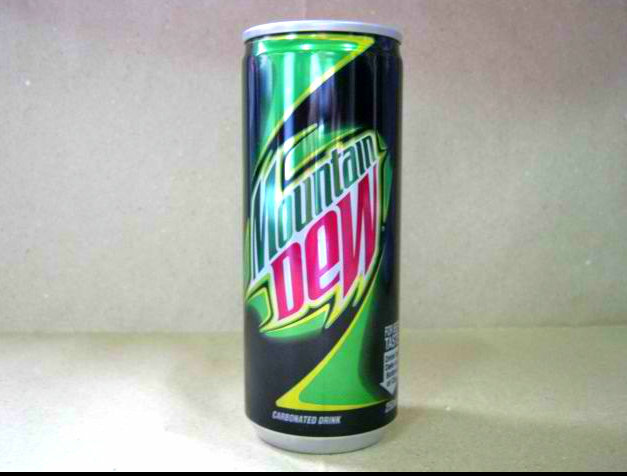 A Google search revealed some guy on ebay in the Philippines was selling a Slim Can of Mountain Dew for 150 pesos, 3.17 U.S. Dollars. That’s a pretty good mark-up since we had only paid 14 pesos. But this guy was selling a 250 ml Slim Can Mountain Dew which he claimed was an exclusive Limited Edition product. The seller, whose auction ended on November 1, 2015, claimed the can was made exclusively by Pepsi-Cola Products Philippines in 2011 for special events only. He goes on to state that the can was made available in selected supermarkets in Metro Manila and satellite cities in limited quantities only. His can had an expiration date of June 25, 2013. After reading that I immediately rummaged through our recycling bin which held metal cans and fished out the Slim Cans of Mountain Dew and Pepsi. The expiration dates were October 2016 and September 2016 respectively. I don’t know if the cans we had were another Limited Edition but since we both already opened the cans and drank the contents, it really doesn’t matter. I had crushed both cans to boot anyway. ← Should You Start a Micro-financing Business in the Philippines? In the Philippines but it keeps her happy , Derek in pasig. It is not limited edition but is most of the time out of stock in groceries. OK, thanks, Anne. Must be out of stock at the local grocery stores we go to in Iloilo, also, never see it in stock, but having items out of stock is not uncommon here.